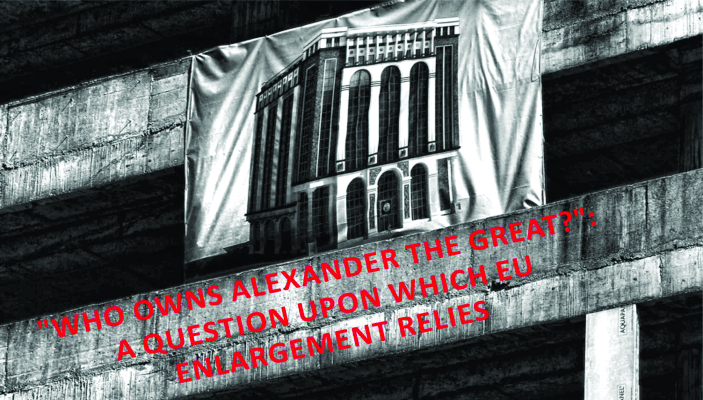 It is our great pleasure to announce the release of the policy analysis “Who owns Alexander the Great?”: A Question Upon Which EU Enlargement Relies,” produced by a team of ISSHS researchers. The findings in this study are based on a national poll concerning “Skopje 2014 Project” and its effects on Macedonia’s EU integration, carried out in September 2013. It also relies on a desk analysis of relevant documents and official statements which provide the context in which the poll data should be interpreted. The present analysis aims at shedding light on the cultural policies and international relations that have conditioned and shaped “Skopje 2014” as a national cultural project of building and sustaining an official narrative of the Macedonian identity. The project has been envisaged, funded and executed by the central and local governments of Macedonia. One of the most significant aspects of the context in which the Project at issue has been carried out is the one of so-called “name dispute” between Macedonia and Greece. The study provides a genealogy of the “name dispute,” with focus on two of its main aspects that are relevant for “Skopje 2014”: the cultural heritage and history of Antiquity. The present study is based primarily on the results of a national poll conducted by ISSHS’s team in September 2013 and on a desk analysis of relevant documents and statements of officials which provide the backdrop against which the poll results should be read. The poll sought to measure the support of the general population of a cultural policy carried out by the Government of the Republic of Macedonia with an ambition to instill an official narrative about the Macedonian ethnic and national identity. The policy at issue has been executed in the form of an architectural and monumental art building project dubbed “Skopje 2014.” It was carried out with the funding and under the patronage of the Macedonian Government as one of its most ambitious cultural policy related projects, officially announced in February 2010. At the center of this project is the reference to the period of Antiquity of the Kingdom of Macedon as the cultural and historic fundament of the Macedonian identity. According to the results of our analysis, the Project’s narrative seems to be at odds with the ruling perception on the matter measured nationwide through the poll whose results are presented below. Namely, the poll shows that the percentage of those who attach defining importance to the period of Antiquity for the formation of the Macedonian identity is 5.8% out of the entire population of the country, and 7.6% among the ethnic Macedonians. According to the perception of the majority of the respondents (19.9%), The Medieval period of Orthodox Slavic Christianity remains to be the defining historic period along with the period of a more recent past, namely Macedonia’s independence from Yugoslavia which took place in 1992 (20.1%). The Yugoslav period (16.9%) and that of the turn of 20th century struggle for a Macedonian nation state and liberation from the Ottoman Empire (13.8%) follow right behind. Based on our desk analysis of relevant official EU policy documents, formal decisions and official statements, we conclude that the Project’s bearing on the accession process is not of direct relevance. The “name issue” between Macedonia and Greece remains to be the central requirement. Nonetheless, through its influence on the “good neighborly relations,” “Skopje 2014” affects the process indirectly. The poll we conducted shows that the opinion on this question is utterly split. A slight majority of the respondents, however, believes that “Skopje 2014 ” does not affect the integration processes (see the results below or in the annex of frequencies). Our poll showed that in a period of less than 4 years, general support for the country’s EU membership has fallen for approximately 24%. If the Project’s aim is to ameliorate the sense of frustration by the indefinitely prolonged accession, as we demonstrated in a previous study on a similar topic (briefly explained below), it evidently does not succeed in doing so. Namely, according to the results of our poll, 73% out of the entire population and 66.5% out of the ethnic Macedonian majority believe the project should not continue. The disapproval is expressly linked with the financial aspect of the Project seen as overly costly for a state which is at the bottom of economic prosperity in Europe in spite of its positive macroeconomic trends. Since the start of “Project Skopje 2014” in the beginning of 2010 until April 2013, 35 objects (buildings, statues and monuments) in predominantly neoclassicist style (accompanied by some approximations of the baroque) have been erected upon the decision and with the funds provided by the Ministry of Culture. Several of the most monumental statues (including the “Warrior on a Horse” representing Alexander the Great) have been built upon the initiative of the Municipality of Center with funds provided by the Government, whereas the Government itself appears as the investor of the new monumental buildings of the Ministry of Foreign Affairs, the Constitutional Court, the baroque facade of the Government building and a couple of others. These numbers were presented at a press conference held on 22 of April 2013 by the Minister of Culture Ms Elizabeta Kančeska-Milevska. At the same conference, Minister Kančeska-Milevska informed that a total of 207.872.492 euro has been spent so far on the project. Macedonia’s GDP gross in 2012 was 7,5 billion euro. According to data presented by Minister Kančeska-Milevska the percentages of the annual state budget spent on the project in the course of 2010-2012 are the following: 1.1% in 2010, 2.2% in 2011, 1.6% in 2012 and, finally 1.5% in 2013. In August 2013, the newly elected Mayor of the Municipality of Center Mr. Andrej Žernovski, member of an opposition party, submitted to the public prosecutor a report of an audit on Municipality’s expenses made for “Skopje 2014” with the approval of its former Mayor, Mr. Vladimir Todorovikj.